The families of victims of five recent attacks in Israel are suing Facebook for more than US$1 billion, saying the social media site helps terrorists plan their violence. 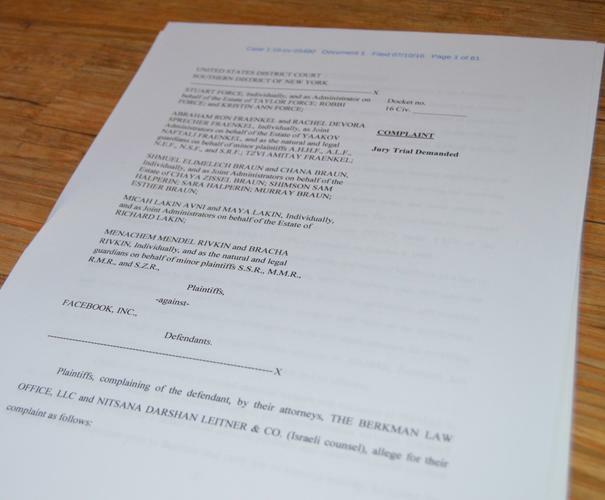 The lawsuit, filed in a New York court, accuses Facebook of helping Palestinian group Hamas recruit members, communicate, and plan attacks. The U.S. government designated Hamas a terrorist organization in 1995. Plaintiffs in the lawsuit are family members of five terrorist attacks in Israel in the past two years, the most recent being a March 8 stabbing attack in Tel Aviv that killed 29-year-old U.S. citizen Taylor Force. Four of the people who died in the attacks were U.S. citizens, and another U.S. citizen was injured. The lawsuit, filed Monday, was brought under the Anti-Terrorism Act of 1992, which prohibits U.S. businesses from providing material support to designated terrorist groups. "This lawsuit should be no surprise to Facebook, which has knowingly provided its social media platform and services to Hamas, its leaders, and affiliates for years, despite repeated complaints and warnings," Israeli lawyer Nitsana Darshan-Leitner, representing the plaintiffs, said by email. Hamas' leader "would not be allowed to open a U.S. bank account, shop on Amazon or receive a U.S. cell phone," Darshan-Leitner added. "But somehow Facebook believes it can provide him and his terrorist associates with social media accounts." Representatives of Facebook and Hamas didn't immediately respond to requests for comments on the lawsuit. Social media has become "a necessary component" of international terrorism, said Darshan-Leitner, who has filed several lawsuits against companies accused of aiding terrorists. Hamas has "recognized the tremendous utility and value of Facebook as a tool to facilitate this terrorist group's ability to communicate, recruit members, plan and carry out attacks, and strike fear in its enemies," the plaintiffs' lawyers wrote in their complaint. For years, Hamas has "openly maintained and used official Facebook accounts with little or no interference."